Hemp has added agricultural benefits, helps with soil improvement, pollen isolation and requires less pesticides than most other crops. Summary extracted from the congressional report "Hemp as an Agricultural Commodity" by Renee Johnson, Specialist in Agricultural Policy, July 24, 2013. The report distinguishes between hemp and marijuana, recounts the commercial uses of hemp and its market potential in the United States, as well as its global production. It concludes that there are obstacles in the way of hemp production in the United States related to government drug policies, which conflate hemp and marijuana and also that the rise of industrial hemp in the United States faces global competition, while retaining a "dedicated and growing demand base." Industrial hemp is a variety of Cannabis sativa and is of the same plant species as marijuana. However, hemp is genetically different and distinguished by its use and chemical makeup. Hemp has long been cultivated for non-drug use in the production of industrial and other goods. Some estimate that the global market for hemp consists of more than 25,000 products. It can be grown as a fiber, seed, or other dual-purpose crop. 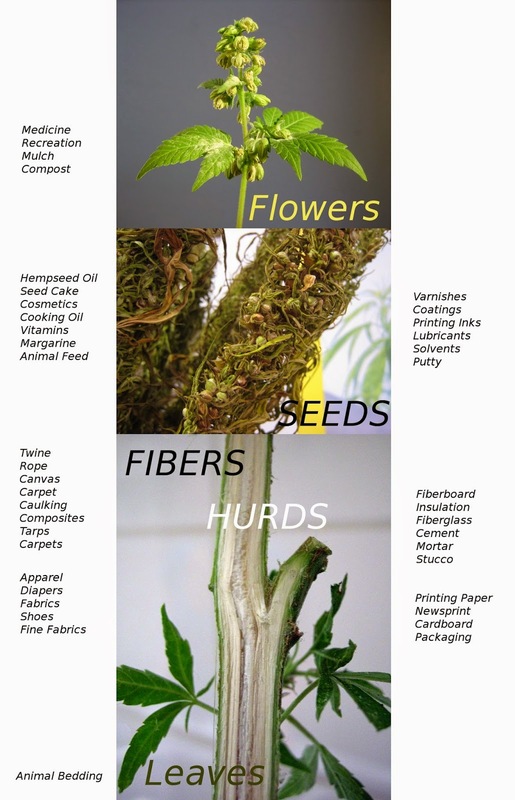 Hemp fibers are used in a wide range of products, including fabrics and textiles, yarns and raw or processed spun fibers, paper, carpeting, home furnishings, construction and insulation materials, auto parts, and composites. The interior stalk(hurd) is used in various applications such as animal bedding, raw material inputs, low-quality papers, and composites. Hemp seed and oilcake are used in a range of foods and beverages, and can be an alternative food protein source. Oil from the crushed hemp seed is an ingredient in a range of body-care products and also nutritional supplements. Hemp seed is also used for industrial oils, cosmetics and personal care, and pharmaceuticals, among other composites. In Canada, the first commercial license for growing industrial hemp was given out in 1998 after research conducted in the previous decade showed that the crop could be hardy, profitable, multivarious in its applications, and subject to regulatory measures. You can read more about why the Canadian government has developed a regulated program for the growth of industrial hemp on the Health Canada website, and even track the progress of this program. These papers distinguish between marijuana and industrial hemp, study the potential of hemp as an alternative crop in various regions and locales, and provide insight into the economic incentive for growing commercial hemp. These downloads include papers, farming guides, media, legal cases and legislation, regulations, studies and testimony about growing hemp commercially. This page includes a comprehensive list of CHTA member sites in the food, industrial fiber and cosmetics sectors among others. An article that describes the state of industrial hemp with useful links to the modern uses of the crop. This link provides an account of where various U.S. states stand on hemp pilot projects under the jurisdiction of the 2014 Farm Bill.